Mission: To destroy bunkers and other fortifications during assault operations as well as other designated targets with the dual mode rocket and to destroy main battle tanks with the HEAA rocket. The Shoulder-launched Multipurpose Assault Weapon (SMAW) is a versatile, lightweight and lethal weapon system. SMAW, employed by the United States Marine Corps for more than twenty years, has proven performance in combat situations, easily demolishing bunkers, breaching fortifications, and defeating armored vehicles. 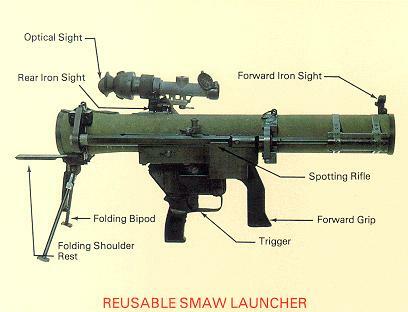 The man-portable SMAW is exceedingly accurate and reliable, exhibiting an average hit probability greater than 90 percent on a 1 x 2 meter target at combat ranges. SMAW is perfectly suited for MOUT scenarios, enabling the gunner to defeat enemy fortifications while remaining under protective cover, greatly enhancing survivability. SMAW will feature even greater capability with a new Confined Space fire-from-enclosure version. Talley Defense Systems, in cooperation with the US Marine Corps, is perfecting a design which drastically reduces backblast and over-pressure, and virtually eliminates flash and smoke when firing the weapon. The SMAW is an 83mm man-portable weapon system consisting of the MK153 Mod 0 launcher, the MK 3 Mod 0 encased HEDP rocket, the MK 6 Mod 0 encased HEAA rocket, and the MK217 Mod 0 spotting rifle cartridge. The launcher consists of a fiberglass launch tube, a 9mm spotting rifle, an electro-mechanical firing mechanism, open battle sights, and a mount for the MK42 Mod 0 optical and AN/PVS-4 night sights. 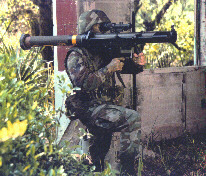 The SMAW system (launcher, ammunition and logistics support) was fielded in 1984 as a Marine Corps unique system. At that time, the SMAW included the MK153 Mod 0 launcher, the MK3 Mod 0 HEDP encased rocket, the MK4 Mod 0 practice rocket and the MK217 Mod 0 9mm spotting cartridge. The MK6 Mod 0 encased HEAA rocket is being added to the inventory. The MOD 0 has demonstrated several shortcomings. A series of modifications is currently planned to address the deficiencies. They include a resleeving process for bubbled launch tubes, rewriting/drafting operator and technical manuals, a kit that will reduce environmental intrusion into the trigger mechanism, and an optical sight modification to allow the new HEAA rocket to be used effectively against moving armor targets. Recently fielded were new boresight bracket kits that, when installed, will solve the loss of boresight problem between launch tube and spotting rifle. During Desert Storm, 150 launchers and 5,000 rockets were provided to the U.S. Army. Since then, the Army showed increased interest in the system. High Explosive Dual Purpose (HEDP) - A "fire and forget" target-sensing fuze allows the warhead to detonate at the optimum moment. Devastatingly effective against bunkers, concrete and brick walls, and light armor, HEDP is in production now. The High Explosive, Dual Purpose (HEDP) rocket is effective against bunkers, masonry and concrete walls, and light armor. High Explosive Anti-Armor (HEAA) - Attains full penetration of heavy armor from nearly any oblique angle. The High Explosive Anti-Armor (HEAA) rocket is effective against current tanks without additional armor. Follow Through Grenade (FTG) - Shaped charge front warhead with full caliber follow-through grenade for use against concrete and brick walls. The 9mm spotting rounds are ballistically matched to the rockets and increase the gunner's first round hit probability. Training is accomplished with the MK7 Mod 0 encased common practice rocket and the MK213 Mod 0 noise cartridge. Common Practice Round (CPR) - Inert training round with full caliber rocket duplicating live round weight, CG and flight characteristics. The 83mm Shoulder-launched Multi-purpose Assault Weapon (SMAW), High Explosive Anti-Armor (HEAA) (DODIC HX06) was last procured in 1999. There have been no further procurements due to a decrease in the Total Munitions Requirement (TMR) for this item. As supported by the attached data, there will be an available inventory of 9,760 rockets at the start of FY03 to support a I MEF requirement of 9,464 rockets and an FY03 training allowance of 481 rockets (It should be noted that within the FY02 TMR the Training Requirement (TR) is 237 rockets). The manufacturer of this item is no longer in business; further procurements will require the qualification of a new manufacturer at a significant cost to the Marine Corps. As of 2002 the 83mm Shoulder-launched Multi-purpose Assault Weapon (SMAW), High Explosive Dual Mode (HEDP) (DODIC HX05) had been, and would remain in production for several years. Prior to 2002 the Marine Corps had made a decision, during the budget formulation process, not to buy this item to the published Total Munitions Requirement (TMR) due to the high cost associated with fully funding this requirement. There was an available inventory of 54,246 rockets at the start of FY03 to support a War Reserve Munitions Requirement (WRMR) of 86,586 rockets and an FY03 Training Allowance of 2,164 rockets (It should be noted that within the FY02 TMR, the Training Requirement (TR) was 1,936 rockets). It was projected that an additional 8,459 rockets would be delivered during FY03. Additionally, the FY04 TMR of 94,933 rockets is an increase to the current TMR of 88,622 rockets.